The skull is a powerful symbol. While others have used real skulls as the basis for drawing, sculpture or installation, Christine Borland has used skulls as a starting point for making works in other materials. 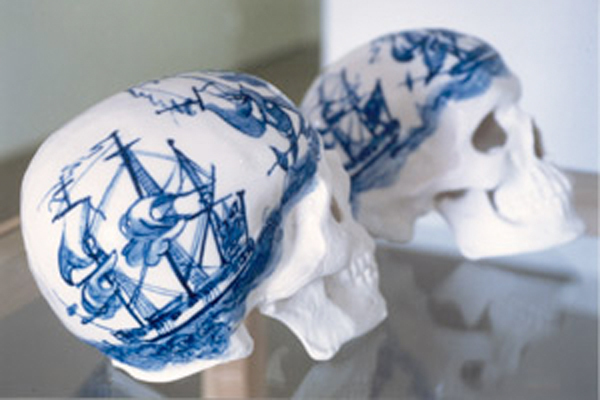 The skulls in Christine Borland’s Family Conversation Piece are made from fine bone china which is then traditionally decorated in blue and white. The work was originally made for an exhibition at Tate Liverpool, so the choice of bone china was a deliberate one intended to resonate with Liverpool’s history as a producer of china with the decoration – in the style of the porcelain made in Liverpool in the eighteenth century – also referencing the city’s history as a trading port involved in the shipping of both produce and slaves. I think what I like about these works is the way the ghoulishness of the skulls is initially offset by the banality of the blue and white pattern but when one reads the imagery and make the connection with the awfulness of the slave trade it is ultimately the decoration that gives the work a real connotation of inhumanity and death. A connection between art and science runs through Borland’s practice and she has used bones in a number of works in very different ways, including working with scientists to attempt to find out as much as possible about a woman whose skeleton she bought through a medical supplier, ultimately reconstructing her features in clay. In Phantom Twins – which was originally titled Twin, Hand-made, Childbirth Demonstration Models – replica foetal skulls are tightly wrapped in the leather that also forms the altogether less precise forms of the bodies. The twins are copies of models made for an eighteenth century Scottish obstetrician. For me, the duplication that makes them twins makes them more ghostly. I think I’d read a single model as a copy; though I recognise that this isn’t the case, as a pair they somehow seem to become a memory of particular twins. This entry was posted in Sculpture and tagged art, bones, Christine Borland, English Family China, Family Conversation Piece, history, Phantom Twins, porcelain, sculpture, skeleton, skull, skulls by Ann Jones. Bookmark the permalink.